[digg-reddit-me]I’m going to start creating a list of best reads for the week every Friday – picking between 5 and 10 articles or blog posts that are well worth reading in their entirety. We have to face the fact that if Pakistan collapses it will dwarf anything we have seen so far in whatever we’re calling the war on terror now. [R]evolutionary upheavals (and state collapse) are hard to predict because individual political preferences are a form of private information and the citizenry’s willingness to abandon the government and/or join the rebels depends a lot on their subjective estimate of the costs and risks of each choice. If enough people become convinced the rebels will win, they will stop supporting the government and may even switch sides, thereby create a self-reinforcing snowball of revolutionary momentum. Similar dynamics may determine whether the armed forces hang together or gradually disintegrate. As we saw in Iran in 1979 or in Eastern Europe in 1989, seemingly impregnable authoritarian governments sometimes come unglued quite quickly. At other times, however, apparently fragile regimes manage to stagger on for decades, because key institutions hold and the revolutionary bandwagon never gains sufficient momentum. I simply refuse to believe in the universality of this new human type of Homo Blogicus – the cosmopolitan and forward-looking blogger that regularly looks at us from the cover pages of the New York Times or the Guardian. The proliferation of online nationalism, the growing use of cyber-attacks to silence down opponents, the overall polarization of internet discussions predicted by Cass Sunstein et al, make me extremely suspicious of any talk about the emergence of some new archetype of an inherently democratic and cosmopolitan internet user. As much as I’d like to believe that internet decreases homophily and pushes us to discover and respect new and different viewpoints, I am yet to see any tangible evidence that this is actually happening – and particularly in the context of authoritarian states, where media and public spheres are set up in ways that are fundamentally different from those of democracies. Civilian life affords us the luxury of a good deal of deontology—better to let ten guilty men go free, and so on. In wartime, there’s almost overwhelming pressure to shift to consequentialist thinking… and that’s if you’re lucky enough to have leaders who remember to factor the other side’s population into the calculus. And so we might think of the horror at torture as serving a kind of second-order function, quite apart from its intrinsic badness relative to other acts of war. It’s the marker we drop to say that even now, when the end is self-preservation, not all means are permitted. It’s the boundary we treat as uncrossable not because we’re certain it traces the faultline between right and wrong, but because it’s our own defining border; because if we survived by erasing it, whatever survived would be a stranger in the mirror. Which, in his own way, is what Shep Smith was getting at. Probably Khalid Sheik Mohammed deserves to be waterboarded and worse. We do not deserve to become the country that does it to him. What should a U.S. citizen, military or civilian, do if faced with a situation in which he or she is confident that a disaster will occur that can only be avoided by waterboarding a captured combatant? Do it, and then surrender to the authorities and plead guilty to the offense. It is then the duty of the society to punish the offender in accordance with the law. We would rightly respect the perpetrator while we punish him. Does this seem like an inhuman standard? Maybe, but then again, I don’t want anybody unprepared for enormous personal sacrifice waterboarding people in my name. But consider, not a theoretical scenario of repeated nuclear strikes on the United States, or a tactical “ticking time bomb” scenario, but the real situation we face as a nation. We have suffered several thousand casualties from 9/11 through today. Suppose we had a 9/11-level attack with 3,000 casualties per year every year. Each person reading this would face a probability of death from this source of about 0.001% each year. A Republic demands courage — not foolhardy and unsustainable “principle at all costs,” but reasoned courage — from its citizens. The American response should be to find some other solution to this problem if the casualty rate is unacceptable. To demand that the government “keep us safe” by doing things out of our sight that we have refused to do in much more serious situations so that we can avoid such a risk is weak and pathetic. It is the demand of spoiled children, or the cosseted residents of the imperial city. In the actual situation we face, to demand that our government waterboard detainees in dark cells is cowardice. It’s interesting how the younger and less constrained Obama is able to flatly state the fact that the War on Drugs has been an utter failure and that marijuana should be decriminalized while still maintaining his opposition to legalization. I’m all for gradual steps and half-measures that push our society in a positive direction – rather than abrupt shifts that prompt backlashes. And I think Obama has the politics of this right, if not the policy – decriminalization must come first and separate from legalization. But once pot is decriminalized, the logic of it’s legalization becomes inevitable. The problem is that decriminalization could just as easily aid the Mexican drug cartels in the short term – as they take advantage of the gray area in which marijuana would exist legally. Of all 7 positive effects that would be possible if marijuana were legalized, only 3 of them would be partially accomplished by decriminalization. The prudent political path then is to make the case for legalization while pushing for decriminalization – with the knowledge that the latter will lead to the former. This statement seems at odds with the more than 6.2 million arrests since 1990 for simple marijuana possession that a 2006 study analyzed [pdf]. According to that report, arrests for possession of marijuana have actually risen – as the War on Drugs was transformed from a war primarily against heroin and cocaine to one against marijuana. The main reason for this discussed by the report is that marijuana arrests pad arrests statistics, although other studies have measured a discernable increase in violent crimes as a result of every police resource wasted on combating marijuana. Perhaps what General McCaffrey was referring to was of the enormous number of those arrested for marijuana possession, only a very small number of those arrested, booked, and otherwise put through the system are convicted of or even charged with any crime. It was policymakers trying to hide behind the skirts of science, trying to say that marijuana poses a threat to the health of young people. Taking any drugs is probably not a good idea. But [marijuana] certainly posed no significant public health problem. In many ways, it’s somewhat reminiscent of 50 years ago when moralists argued that masturbation was morally wrong. They couldn’t just argue that it was morally wrong, so they argued that it made you insane. They were able to get enough physicians to say, “Yes, masturbation makes you insane,” and people argued that this was causing insanity. Therefore, you were justified in condemning masturbation. I see the same sort of process with the use of marijuana, which is a trivial health problem. The war on drugs is an utter failure. Now that senator is president of the United States of America – and though he offers better policies and a softening of the hardest edges of the Drug War (which includes refraining from calling it a war), he does not offer the bold action that we need to make us safer. The Obama administration seems content to maintain the prohibitionist policies “firmly rooted in prejudices, fears and ideological visions” that have failed decisively (in the words of the major report on the Drug War by the former presidents of Mexico, Brazil, and Columbia.) But the War on Drugs and the prohibition it is based on endanger both our liberty and our security. Both must end. [digg-reddit-me]QUESTIONER: …[W]hy not just legalize drugs? Discussing Mexico and US drug policy at the Council on Foreign Relations on February 23, 2009. 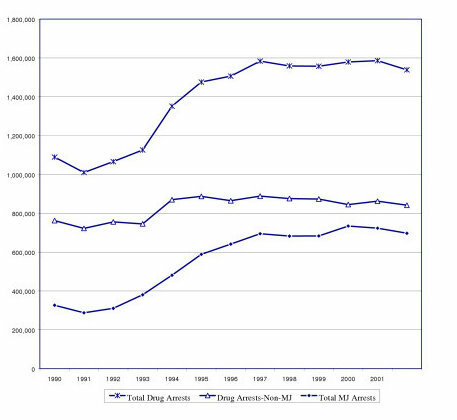 General McCaffrey as drug czar vehemently opposed medical marijuana; he accelerated the militarization of the Drug War in Columbia and Mexico; and during his time as drug czar, arrests for marijuana possession soared above those for harder drugs (See graph on page 3 of pdf). After years of failure to dent domestic demand for drugs, this chief drug warrior now admits he doesn’t care if drugs are legalized and that he sees nothing wrong with growing your own marijuana. It is incredible that someone could pursue the policies he did – and now state that he either didn’t or doesn’t strongly believe drugs should be illegal. [T]he available empirical evidence shows that the harm caused by [marijuana] is similar to the harm caused by alcohol or tobacco. More importantly, most of the damage associated with cannabis use – from the indiscriminate arrest and incarceration of consumers to the violence and corruption that affect all of society – is the result of the current prohibitionist policies. From Drugs and Democracy, a report by César Gaviria (former president of Columbia), Ernesto Zedillo (former president of Mexico), Fernando Henrique Cardoso (former president of Brazil) and numerous other prominent Latin American figures released February 11, 2009. There’s no one so brave and wise as the politician who’s not running for office and who’s not going to be. It is notable that so many of our prominent politicians reveal after they leave office that they don’t really agree with the premise of the War on Drugs – a war which is consuming billions of dollars, waging war on our citizenry, jailing a higher percentage of our citizens than any other nation, destabilizing our neighbors, competing with and undermining anti-terrorism measures, and making America less safe. Obama has taken a number of sensible positions on Drug War issues – but he has not publicly acknowledged what most informed observers can see – that the War on Drugs has failed, is wasting money, and making us less safe. It is inconceivable that a reflective, informed policy-maker such as Obama does not realize this as well. I agree with you. I want to do it. Now make me do it. In other words, we must put pressure on Obama if the hopes of reform advocates and Obama administration insiders are to be realized. I had a column about how A-Rod wasn’t going to be charged with anything but that Phelps probably was – but apparently the local sheriff – after 8 arrests – thought better of wasting to many resources. At least one in five people in state prisons are doing time for drug offenses. What must they think, rotting away in musty cells, hearing a president or a celebrity athlete dismiss their mistakes with the hoary line of young and stupid? …Phelps seemed contrite in trotting out his young and stupid defense. “I’m 23 years old and despite the successes I’ve had in the pool, I acted in a youthful and inappropriate way,” he said. A-Rod will likely face no legal consequences, nothing from the the toothless barons of baseball. Phelps took his hit for recreation. Rodriguez did his drug to cheat the game and himself. He lied about it. And then he blamed it all on his age and pressure to perform because of his oversized contract. His punishment will come from the Bronx fans, brutal in their daily assessments, people who know that if they put a syringe in their arm while working with heavy equipment nobody will cut them a young-and-stupid break.